I have a problem with pvsti instruments played with Polac vsti. The second G-4 is not played because the first "off" of the G-4 is not played yet. It's the same with implicit (another note starting) or explicit "off". I can correct manually the problem if I shift slightly the "off". But it's very difficult to find every place where the problem occurs. Hi, it's possibly vstdependant, here it seems to work correctly with some vsts. The first g-4 note off should be processed before the second g-4 note as it is sent on sampleframe 0 in block whereas the second g-4 is sent on sampleframe 1 in the block. I'm doing a stable sort on the events later on so they should be in right order. It could be problematic If I would send both g-4 and note off on sampleframe 0, in this case the note off is processed right behind the second g-4 and cuts the note. However there are vsts that do not position their midi events sample-exact, mostly older vsts I suppose, they ignore the sampleframe positioning completely, this could cause some problems. I use ARIA player VST (with Garritan Personal Orchestra sounds). This player has a good reputation. I import a midi file in buzz (with the pianoroll), switch to Pattern XP, then play it. Playing the same midi file with the same ARIA player using another midi player (Reaper ...), works correctly. But I suppose there is no reason that this is not the case. Would you have the possibility to try with ARIA player ? Old topic but I'm experiencing similar issues. It seems that randomly either note or note off is not being processed. I tried to find reproducible pattern or combination of buzz or polac adapter settings that could narrow down the problem but no luck. Using midi keyboard or PC keyboard to play live works perfectly fine. But it seems that there is some sort of disconnection between pattern data and vst. It can be reproduced with for example Omnispehre 1 when you write 3-4 note chords with note offs before next chord. I used latest Polac adapters, Pattern XP, 121 BPM, 4 TPB, samplerate 88200 although these do not seem to be the reason for the issue. Did you figure out what was the problem? on my system I had that suspect for VSTs with low number of parallel voices. On a long sustaining pianosound you can see keys "pressed" which are definitely not pressed (but still silently played?) running into not played other notes? For some VST you can not cut OFF the notes because its not implemented in the VST. So its a problem of the VST I suppose. 3. Select MIDI Note, MIDI Velocity and MIDI Delay under Pattern XP. Click Ok.
4. Move data from Note to MIDI Note, Velocity to MIDI Velocity etc. The result is that the pattern plays as it is composed. It seems that the 'MIDI' versions of the same columns somehow get the data correctly sent to VST. interesting. could you please post a screenshot of your setup or upload a bmx file ? zip. 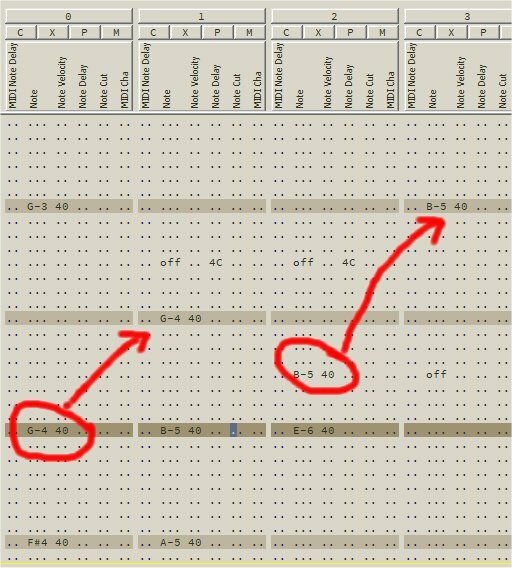 Start with an empty project, one instance of Omnisphere 32bit and one pattern with chords is enough to reproduce the issue. I'm starting to think this is VST related since I could not reproduce this issue with other plugins. And I found a workaround: switching to 64bit version of Omnisphere fixes the issue. Go figure!